Zoë began teaching and presenting in 1997. She was asked to teach Minnesota governor Tim Pawlenty how to bake Christmas cookies on NBC affiliate KARE 11-TV. Since then she has made several appearance on television, national radio and featured in newspapers all over the country. She teaches at Cooks of Crocus Hill, Whole Foods, The University of Minnesota and other cooking schools around the country. She participated in the exclusive Baking and Pastry Arts Invitational Retreat for America’s leading pastry chefs, sponsored by the CIA and Food Arts Magazine where she worked with the leading chefs in the country. Zoë is the co-author, with Jeff Hertzberg, of Artisan Bread in Five Minutes a Day, Healthy Bread in Five Minutes a Day, and more. Since their widespread popularity and success, new and updated versions of both of these books have been published with even more great tips and recipes. The books have been widely acclaimed in newspapers and magazines nationally, including the New York Times, Boston Globe, Chicago Tribune and many others. Zoë is a product development consultant for General Mills and a number of restaurants. 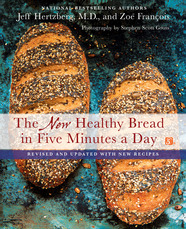 The New Healthy Bread in Five Minutes a Day has 33 new recipes as well as old favorites, including 100% Whole Wheat Bread, Whole Grain Garlic Knots with Parsley and Olive Oil, Whole Grain Crock Pot Bread, Rosemary Flax Baguette, Cinnamon-Raisin Whole Wheat Bagels, Pumpkin Pie Brioche, Raisin Buns, Challah, Whole Wheat Soft Pretzels, gluten-free breads, and many more. 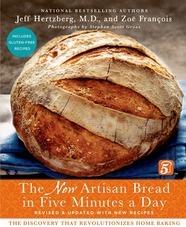 A fully revised and updated edition of the bestselling, ground-breaking Artisan Bread in Five Minutes a Day—the revolutionary approach to bread-making. With more than half a million copies of their books in print, Jeff Hertzberg and Zoë François have proven that people want to bake their own bread, so long as they can do it easily and quickly. Based on fan feedback, Jeff and Zoë have completely revamped their first, most popular, and now-classic book, Artisan Bread in Five Minutes a Day. Baking Your Own Artisan Bread in Five Minutes a Day A lecture and demonstration of the methods from the author’s best-selling bread cookbook. How to Write a Best-Selling Cookbook Jeff and Zoe Francois developed a simple concept, and went on to write one of the best selling cookbooks of 2008 with Artisan Bread in Five Minutes a Day. Jewish Recipes from Artisan Bread in Five Minutes a DayA lecture and demonstration, focusing on Jewish recipes. Get access to even more exclusive recipes on the Artisan Bread website. Check out a Q&A with Zoë and Jeff.